This tutorial will explain how discussion forums work in Conversr (sometimes abbreviated as CNS), and how best to organise them. 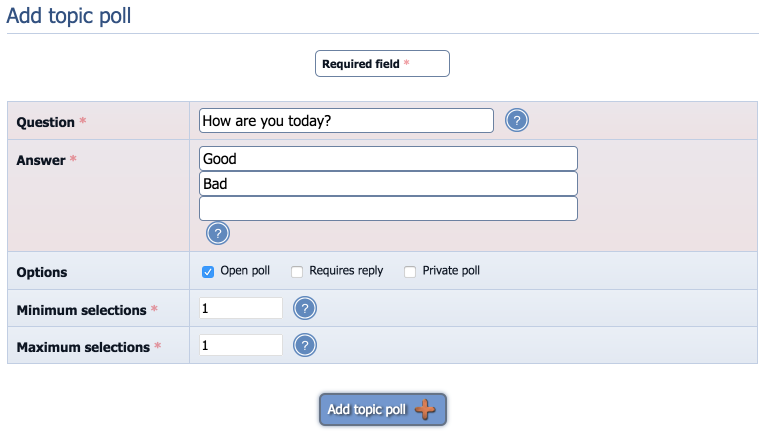 Discussion forums are a communication tool for site users, based around topics of conversation located within forums. Discussion forums are organised into a hierarchical structure (also known as a tree structure). The forum you view when you visit the discussion forums is the home forum in the hierarchy, and contains child forums (sub-forum s), which may themselves contain child forums, and so on. Within each forum there may also be topic s (known as threads in some other software). And within each topic, there are one or more post s.
Forums are actually a very powerful collaboration tool, not merely limited to chat. For example, ocProducts used a forum as an integral part of the process for the designing of the software you're using right now: it is surprising what forums and topics can be made to represent. So, now that I have explained the structure of a discussion forum, I will explain what each of these constructs are for. A forum exists to organise topics into some kind of common subject. For example, it is common for a website to have a debates forum, which contains member-created topics, each representing a single debate. A topic in the debates forum such as a topic titled 'Does extraterrestrial life exist? ', contains a number of member-created posts, that together form a continuing line of discussion. A topic gets created, in the most appropriate forum, when a member wishes to discuss something and knows of no topic to continue (by making a new post in); the topic is started with a single post, that leads the discussion, by the member who made the topic. The sub-forum system exists so that forums may be organised such that subjects are logically sub-classified in such a way as to prevent an 'explosion' of forums displayed on the home forum (which would be cluttered and difficult to navigate). Whether a forum with sub-forums should itself be able to hold topics is up to you, but often allowing this is a useful technique for allowing placement of a topic that classifies under a forum, but not one of the sub-forums. You can delete a forum from the bottom of its edit form. The root forum cannot be deleted, however. While discussion forums are primarily meant for discussion, they may in fact be used for the general purpose of conveying information. It is often useful for a topic that may-not-be-replied-to be made by staff to convey some form of alert. Why? The discussion forums might be used rather than news, or some other Composr medium, due to the easiness of creating and organising topics, or to target an audience that views the discussion forums more regularly than the other mediums. Apart from forums, topics, and posts, there is one additional organisational construct in the inbuilt forum system: forum groupings (known as 'categories' in some software). However, forum groupings have a very limited effect on organisation. The system stores a number of groupings, and any forum, at any position in the tree can be 'tagged' against one of these groupings: the groupings have no effect on, and are not a part of, the forum structure, and all they do is group up sub-forums of the same forum grouping visually. By default, every forum is of the forum grouping 'General' and hence all sub-forums are grouped under this when displayed. You can delete a forum grouping from the bottom of its edit form. Topics may be moved between forums by moderators. When you design your discussion forums, you need to decide what forums you will create, and how to organise them. A very common mistake is to create far too many forums, which has the effect of diluting your community, and making it feel dead: which in return often terminally reduces member activity. If a month after creating a forum, you expect it to have less than ten topics, then you probably should not be making it: remember: you can always add new forums later, and mass move topics into them. Conversely, it would be a mistake to create too few forums, leading to a situation where it is difficult to locate topics. Conversr creates a default forum structure which is appropriate for a small or new community. To encourage discussion specific to your site, you may wish to add a new grouping with perhaps 3 forums (sub-forums of the home forum) placed in that grouping. Forums use the standard Composr permissions system. All forums define which usergroup have access to them (view access), as well as allowing privilege overrides for each usergroup. It is common to deny most usergroups any kind of access to certain forums, such as staff forums, in order to make them private to all but select members. Using usergroups (often multiple per member) you then assign access by putting the members in the respective usergroup(s). The view access check box only gives view access to a forum (not posting access, etc). Likewise, if a forum view access box is unchecked for any particular usergroup that only means there is no view access to the forum for the particular usergroup. Un-checking the forum view access check box does not stop or take away any other permissions – it simply takes away view access for a particular usergroup. Members have the 'best' permissions when all their usergroups' permissions are considered. For example: Let's imagine a member is in 3 usergroups, A, B, and C, and usergroup C has the privilege to post in the forum but usergroups A and B do not. That member will be assigned posting access, because the necessary privilege can be found within his/her usergroups. This is calculated on a permission-by-permission basis. If one of their usergroups grants them certain privileges, and another grants them other privileges, he/she gets the combined set of privileges. If one usergroup grants view access but not posting privilege, and one usergroup grants posting privilege but not view access, a member in those usergroups gets both. There is one exception to the above rules: negative privileges overridden against particular forums take precedence over global privileges. For example, if usergroup X is granted the global privilege necessary for posting ("Submit low-impact (medium visibility) content"), but usergroup Y is explicitly denied posting on one particular forum, then a member in those usergroups would not be assigned posting privilege for that particular forum. Overrides always take precedence. This flexibility is very intentional – you have a choice of setting things at a high level to apply to the whole website, but also the choice to make overrides at a lower level. 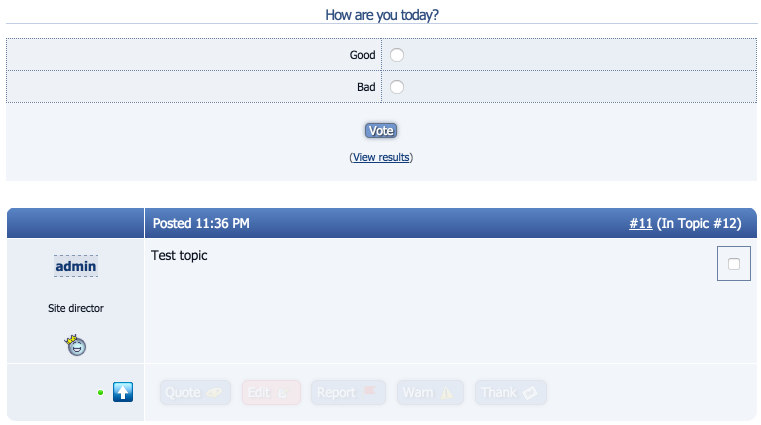 Members have a feature where they can choose to post anonymously. If they do this, their post will show as a guest post. If you see guest posts somewhere where guests cannot post then this is probably why. Staff can track which user made the post via clicking on the 'Guest' label and hence investigating the IP address. This is no different to an investigation on a normal Guest post. Replies can either be made beneath the topic ("quick reply"), or via the full reply screen. If your users are confused by the quick reply function (for example, they miss the WYSIWYG), you can turn off the 'Use quick reply' privilege for them. There is an edit post button underneath each post. If you edit a post then you get to choose whether it shows as edited or not. The default is for this option to be checked unless you edit quickly (within 3 minutes). The special case here is because we assume that the edit is a quick correction rather than being a retraction that should be advertised. Staff can view full post history: edits aren't secret from staff. There is a delete post button underneath each post. You can find the post ID from above (before) the post in the topicview. Conversr was designed to be a powerful forum in its own right. Since the time of Conversr's development, standalone forums have actually reduced a lot in popularity, for the same reasons that we decided tight integration was the way to go – a consistent user experience across a whole website is the way to go, instead of having community features mostly siloed off on some separate piece of software. That ended up being called 'Web 2.0' and then 'Social media', but it basically is what Composr's philosophy always has been: an interactive and integrated cross-website experience. However most "new forums", written from scratch to provide this tight integration, are cut down in functionality and lack a lot of really important features, while we've matched and raised the functionality at the same time as properly integrating it. This is one thing we're quite proud of about with Composr: we don't just throw away proven functionality to create the new, we embrace established concepts and build industry innovations right into the core of it all.